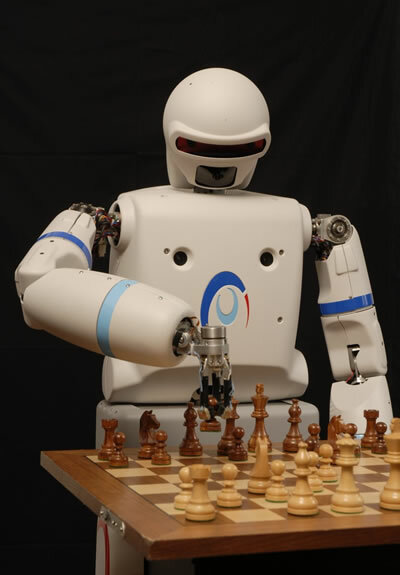 REEM-A is designed to play well with humans; it can play chess, hold objects, stroll around with people and answer questions and follow commands. REEM-A can also do face recognition. REEM-A is a prototype built by PAL Technology Robotics. The friendly robot is about four feet ten inches tall and weighs about ninety pounds. It can carry five pounds in each arm; both arms are equipped with gripper claws (which are also used when REEM-A plays chess. REEM-A is in the tradition of science fictional robots that are easily able to walk with and converse with human beings. And play chess with them. Then I remembered that Moxon had once spoken to me of having invented such a piece of mechanism, though I did not understand that it had actually been constructed. See more pictures and videos of REEM-A standing and walking with people; via PAL Technology Robotics.